Diabetes – A killer in the disguise of sugary name!Diabetes is described as a metabolic disorder in which the body cannot properly store and use the energy found in food. You might be hearing every other day that someone in your family has Diabetes Mellitus or even know someone who has to take insulin each day to manage it. Diabetes is a growing serious complex metabolic disorder all over the world. It is a complex group of diseases with a variety of causes. To understand diabetes, first we must understand how glucose is normally processed in the body. Glucose is a form of sugar which is the main source of energy for our bodies. Unhealthy levels of glucose in the blood can lead to long term and short term health complications. Glucose comes from two major sources: food and your liver. Sugar is absorbed into the bloodstream, where it enters cells with the help of insulin. Your liver stores and makes glucose. When your glucose levels are low, such as when you haven't eaten in a while, the liver breaks down stored glycogen into glucose to keep your glucose level within a normal range. Diabetes results when sugar (glucose) gets trapped in the blood, instead of being taken up by cells and stored or used for energy. High levels of sugar in the blood can be toxic to certain organs in the body. Over time it can lead to many health complications like; kidney failure or blindness. In severe cases, patients may have problems with blood circulation, leading to heart disease and stroke, or even amputation of a limb. Diabetes requires daily self care and if complications develop, diabetes can have a significant impact on quality of life and can reduce life expectancy. Knowing better how diabetes affects our body can help you look after our body and prevent diabetic complications from developing. Many of the effects of diabetes stem from high blood pressure, high cholesterol levels and a lack of blood glucose control. While there is currently no cure for diabetes, you can live an enjoyable life by learning about the condition and effectively managing it. The body needs energy to use during daily activities. The body gets that energy when food is converted into glucose (a form of sugar) that is dumped into the bloodstream. When a person eats a meal, an organ called the pancreas secretes the hormone insulin. Insulin encourages cells to drink up the new sugar or glucose circulating in the blood. They can use it for energy, or store it to use later. Diabetes is caused by a problem in the way our body makes or uses insulin. Insulin is needed to move glucose (blood sugar) into cells, where it is used for energy. People with type 1 diabetes don't make any insulin. People with type 2 diabetes make insulin, but their cells do not respond to it very well. In both cases, the amount of sugar circulating in the blood raises to toxic levels. Diabetes can be caused by too little insulin (a hormone produced by the pancreas), resistance to insulin, or both. When food is digested, a sugar called glucose enters the bloodstream and glucose is a source of fuel for the cells. Pancreas makes insulin which moves glucose from the bloodstream into muscle, fat, and liver cells, where it can be used as fuel. People with diabetes have high blood sugar, because pancreas does not make enough insulin or their muscle, fat, and liver cells do not have enough receptors to respond to insulin normally, or both. If glucose does not get into the cells, the body cannot use it for energy. Too much glucose will then remain in the blood, causing the symptoms of diabetes. Type 1 diabetes (insulin dependent diabetes, juvenile diabetes) occurs when the body makes little or no insulin, the hormone that allows glucose to enter body cells. Without enough insulin, glucose builds up in the bloodstream instead of going into the cells. The body is unable to use this glucose for energy despite high levels in the bloodstream. This leads to increased hunger. In addition, the high levels of glucose in the blood cause the patient to urinate more, which in turn causes excessive thirst. Within 5 to 10 years, the insulin–producing beta cells of the pancreas are completely destroyed and the body can no longer produce insulin. Type 1 diabetes can occur at any age, but it usually starts in people younger than 30. Symptoms are usually severe and occur rapidly. Type 2 diabetes (Noninsulin–dependent diabetes) is far more common than type 1 and makes up most of all cases of diabetes and usually occurs in adulthood. Many people with type 2 diabetes do not know they have it, although it is a serious condition. Type 2 Diabetes is usually accompanied by obesity and insulin resistance. Insulin resistance means that insulin produced by pancreas cannot get inside fat and muscle cells to produce energy. Since the cells are not getting the insulin they need, the pancreas produces more and more. Over time, abnormally high levels of sugar build up in the blood. This is called hyperglycemia. Many people with insulin resistance have hyperglycemia and high blood insulin levels at the same time. People who are overweight have a higher risk of insulin resistance, because fat interferes with the body′s ability to use insulin. Type 2 diabetes usually occurs gradually. However, type 2 diabetes can also develop in those who are thin, especially the elderly. Family history and genetics play a large role in type 2 diabetes. Low activity level, poor diet, and excess body weight (especially around the waist) significantly increase the risk for type 2 diabetes. People with type 1 diabetes require shots of insulin to lower their blood sugar. People with type 2 diabetes reduce blood sugar levels by modifying their diet and increasing their physical activity. Medication may also be required. 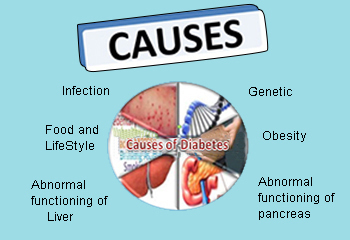 Diabetes is influenced by many genes and environmental factors. If type 2 diabetes runs in your family, you may have inherited factors that make you more susceptible to this disease. A major risk factor for developing type 2 diabetes is obesity. Obesity causes a person's cells to forget how to use insulin (the hormone that signals cells to take up sugar). The rate of Type 2 diabetes is rising dramatically among teenagers and young adults in the United States, mirroring increasing rates of obesity. 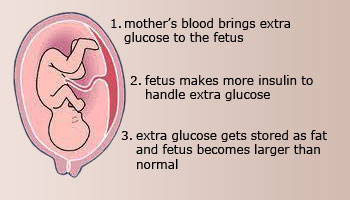 Gestational diabetes Gestational diabetes is defined as glucose intolerance during pregnancy. During pregnancy, hormonal changes can cause the body to be less sensitive to the effect of insulin. These changes can lead to high blood sugar and diabetes. High blood sugar levels in pregnancy are dangerous for both mother and baby. Gestational diabetes refers to high blood glucose that develops at any time during pregnancy in a woman who does not have diabetes. During pregnancy, the placenta produces hormones to sustain the pregnancy. These hormones make your cells more resistant to insulin. Normally, the pancreas responds by producing enough extra insulin to overcome this resistance. But sometimes the pancreas can't keep up. When this happens, too little glucose gets into your cells and too much stays in your blood, resulting in gestational diabetes. Gestational diabetes is usually diagnosed during the 24th to 28th weeks of pregnancy. In many cases, the blood glucose level returns to normal after delivery. It is recommended that all pregnant women be screened for gestational diabetes during the 24th and 28th weeks of their pregnancy. The symptoms are usually mild and not life–threatening to the pregnant woman. However, the increased maternal glucose (blood sugar) levels are associated with an increased rate of complications in the baby, including large size at birth, birth trauma, hypoglycemia (low blood sugar), and jaundice. There are many risk factors for diabetes, including family history, Obesity, High blood pressure, high levels of triglycerides in blood, High blood cholesterol level and sedentary life style with little or no exercise. High blood levels of glucose can cause several problems, including frequent urination, excessive thirst, hunger, fatigue, weight loss, and blurry vision. 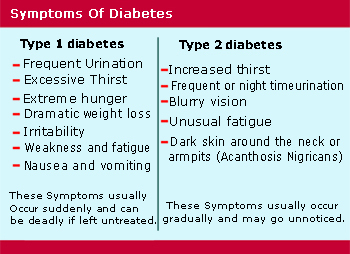 Symptoms of type 1 diabetes are increased thirst, increased urination, and weight loss in spite of increased appetite, fatigue, nausea and vomiting. Patients with type 1 diabetes usually develop symptoms over a short period of time, and the condition is often diagnosed in an emergency setting. Symptoms of type 2 diabetes include increased thirst, increased urination, increased appetite, fatigue, blurred vision and slow–healing infections. However, as type 2 diabetes develops slowly, sometimes people with high blood sugar experience no symptoms at all. Coffee and Diabetes!!! 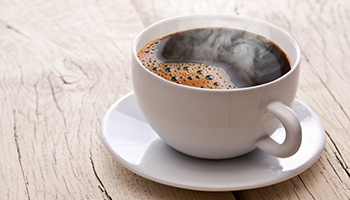 What is the link between Coffee and Diabetes? Read on to know the recent research related to this! The best and the right way to reduce the risk of developing type 2 diabetes is to stay active. Physical activity helps you maintain a healthy weight, and it helps your cells use insulin more effectively. Proper nutrition will help you maintain a healthy body weight as well. 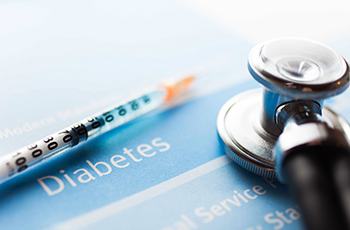 [Source: WebMD Health News] Type 2 diabetes is the most common type. In those who have it, the body does not have enough insulin or the cells ignore the insulin. The hormone insulin, made by thepancreas, is crucial to move glucose to the cells for energy. "We exposed hIAPP to coffee extracts, and found caffeine, caffeic acid, and chlorogenic acid all inhibited the formation of toxic hIAPP amyloid and protected the pancreatic cells," researchers tells. All three had an effect. However, caffeic acid was best. Caffeine was the least good of the three. Those results suggest decaf coffee works, too, to reduce risk, Huang says. "In decaffeinated coffee, the percentage contents of caffeic acid and chlorogenic acid are even higher [than in regular coffee], whereas the level of caffeine is greatly reduced. ""We expect that decaffeinated coffee has at least equal or even higher beneficial effect compared to the regular caffeinated types," Huang says. In patients who already have diabetes, he says, several studies suggest decaf is better for them than regular coffee.The National Basic Research Program of China, the Natural Science Foundation of China, and other non-industry sources funded the research. Cortisol and Diabetes are related!When cortisol levels are consistently high but there’s no physical activity to buffer the effects of chronic stress, the consequences may contribute to type 2 diabetes. [Source: American Diabetes Association] Type 2 diabetes is a modern epidemic, but an enduring puzzle is why it’s spreading faster in some groups than in others. Researchers once thought genes might account for the dramatic differences. Studies trying to tease out the reasons for disparities in type 2 diabetes risk have also examined factors such as physical activity, nutrition, and family history of diabetes. But there’s increasing evidence that the environment we live in plays a bigger role than the genes we’re born with. The everyday stresses people face, such as poverty and discrimination—factors that some people live with more than others—may be taking a physical toll. “There’s substantial evidence to demonstrate the environment we live in has direct impacts on our health,” says exercise physiologist Rebecca Hasson, PhD, director of the Childhood Disparities Research Laboratory at the University of Michigan. One reason is a hormone called cortisol. 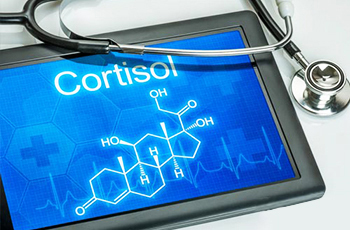 Cortisol puts gas in the body’s tank: It tells the body to increase blood glucose, directs cells to resist insulin’s signals to absorb and store blood glucose in favor of keeping it available for muscles to burn, and prompts cravings for high-calorie foods. It’s released in times of stress to help supply the body with as much energy as possible, as part of the “fight or flight” response to immediate threats. 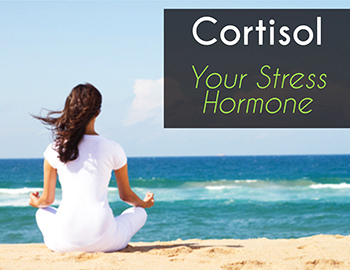 “Cortisol is a biomarker of stress,” Hasson says. When cortisol levels are consistently high but there’s no physical activity to buffer the effects of chronic stress, the consequences may contribute to type 2 diabetes. Higher cortisol results in higher insulin resistance, for example, forcing the pancreas to produce more insulin to get a response. With ongoing insulin resistance, the insulin-producing beta cells wear out, causing type 2 diabetes.